I went to the Chicago History Museum to see the bed in which Abraham Lincoln died. April 15 had been the 150th anniversary of Lincoln’s assassination and I’d spent part of that evening touring the Peterson House. The Peterson House, across the street from Ford’s Theatre, is where the President was taken after he’d been shot by John Wilkes Booth and where, at 7:22 am the next morning, he died. The house and its furnishing were sold after the deaths of owners William and Anna Peterson (just a few months apart) and the bed eventually ended up with Chicago candy-maker and collector-of-historic-artifacts Charles Gunther. After Gunther died, the Chicago Historical Society bought some of his collection, including the bed. “What’s your favorite exhibit?” my friend Kathleen asked the young woman who had just sold us our museum tickets. So we started with the fashion exhibit. 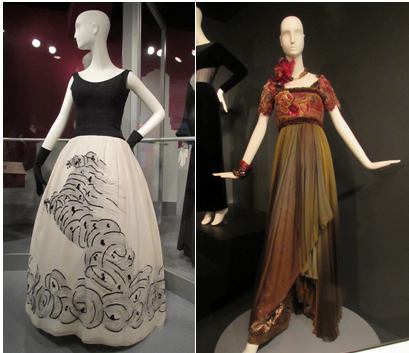 The clothing on exhibit was late 20th century couture — examples of “Chicago style.” Scarred forever by the avocado green appliances of my childhood, I’ve always found the late 20th century the most design-challenged of eras. But I did manage to find a tolerable 1961 black and white hand-painted Philip Hulitar dress, worn by a Chicago socialite at her daughter’s debutante ball. I included the photo of the 1993 Christian Lacroix silk and embroidery jumpsuit for Downton Abbey fans, because it reminded me of Lady Sybil’s harem pant outfit. From fashion, we moved to another part of the first floor. “I think there’s an exhibit on immigration in here,” said the third in our History Tourist group, Mary Lou. We went into the exhibit but it was decidedly not about immigration. And it also didn’t contain The Bed. It was mostly dioramas of 19th century Chicago with one exception: an oddly out-of-place silver peace medal given by President George Washington to a Native chief in 1793. We went into other rooms with interesting objects: a 1989 Wizard of Oz hat by a Chicago milliner (Frank Baum lived and the book was first published and sold in Chicago), a ca. 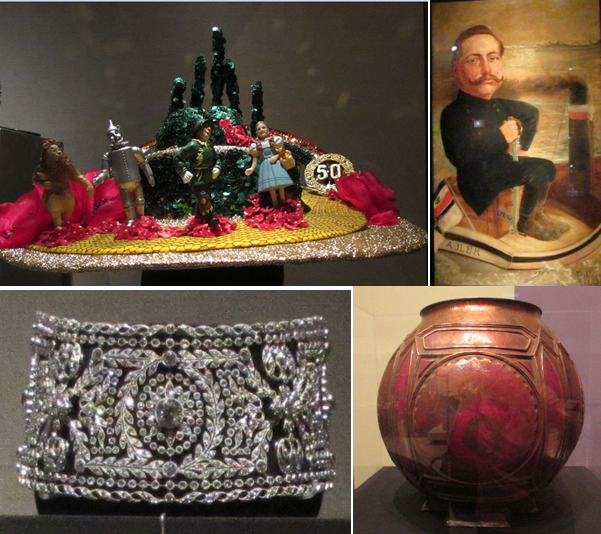 1895 cartoon of Kaiser Wilhelm II, a 1900 diamond necklace, a 1900 copper urn made by Frank Lloyd Wright. But no Lincolnalia. Where, oh where, was Lincoln? Not, it turned out, in a second floor area that the map had labeled Lincoln. The first item I saw as I entered the room was a gold watch presented to President-elect Abraham Lincoln in 1861 by a Springfield, Illinois newspaper. That was promising. But when we went further into the room, there was … nothing. Well, not nothing. There were caterers setting up for an event. And portraits on the walls. His response: “We have a bed, but it’s in Springfield.” The Lincoln Bed had been loaned to a museum in Springfield. “It usually sits right here,” he said, waiving his arm around the center of the second floor landing. He may have heard the silent scream that I was screaming in my head. Or the anguished “Noooo!” that actually came out. Because he said, “We have the table from Appomattox that Robert E. Lee signed the surrender on. It’s in the back of that room.” And looked at me with an I hope that satisfies you, crazy lady look. The Union soldiers who were with General Grant at Appomattox Courthouse took everything that wasn’t nailed down (and probably some things that were) from the McLean House parlor after the surrender signing. Eventually, the table, like The Bed, ended up with Charles Gunther. I know. That’s not the table. The gold watch that Lincoln got looked like any other gold pocket watch, and the marble topped table that Lee used looked like a square, heavy Victorian table. Really nothing exciting about either of them. So I’m going to show you, instead, my favorite Civil War related object in the collection: the diary of Private William Huff of Company E, 13th Regiment of the Louisiana Volunteer Infantry. He was captured at the Battle of Chickamauga, Georgia on September 20, 1863 and sent to the Union’s Camp Douglas, in Chicago. There he kept a diary. 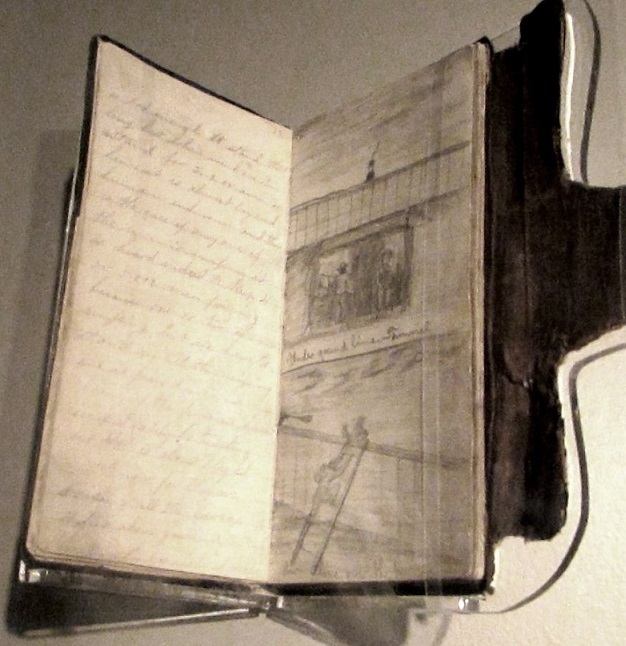 The diary contains about 30 drawings and the museum has it opened to one of them. To me, it looks like a guard above and an escape below, but I can’t tell what the middle shows. I wondered what happened to Private Huff. The exhibit didn’t say and a quick internet search didn’t reveal anything more about him. Gallery | This entry was posted in Illinois and tagged Charles Gunther, Chicago History Museum, Christian Lacroix, Philip Hulitar, William Huff. Bookmark the permalink. Looks like “underground tunnel” on the top and the results on the bottom but it’s hard to tell. Now I’d like to know about Private Huff, too! I thought that it looked like a bunker of some kind, but didn’t consider a tunnel. But now that you mention it, I can see that the last word in the writing in the middle of the page looks like tunnel. Let us know if you ever find out more about Private Huff. Bummer about the bed! It must be a Chicago thing. I went to the Art Institute there specifically to see American Gothic to find that they had loaned it! To me the top picture looks like a lighthouse and the bottom, I agree, looks like an escape. Not sure on the middle either. I didn’t get to the Art Institute on this trip, but have been there before and remember American Gothic. It’s a disappointment to miss something that you’ve set your heart on. It’ll teach me to check on these things before I go — although I’d have gone to Chicago and to the History Museum, even knowing that the bed wasn’t there. I would have gone to the Art Institute also, although I wonder if they actually post on their websites that a famous piece is not there. It seems that they wouldn’t want to miss the traffic from folks who decide not to visit if they know the piece isn’t there. Thanks so much for posting amazing trips!